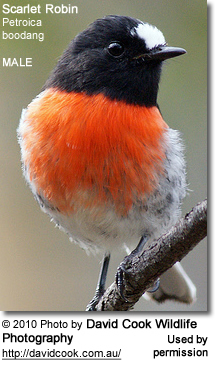 The Scarlet Robins (Petroica boodang) are common red-breasted Australasian robins that are found on continental Australia and its offshore islands, including Tasmania. 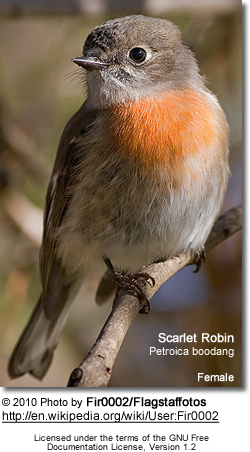 Scarlet Robins range in size from 12 to 13.5 cm in length and weigh between 12 and 14 g, and have relatively large heads. Males have black heads, backs and tails, black and white wings, a red breast and white belly, forehead and rump. Females are generally duller, with brown plumage instead of black, a much more washed out red on the breast and a buff belly. Young birds resemble the female but lack the reddish wash on the breast. 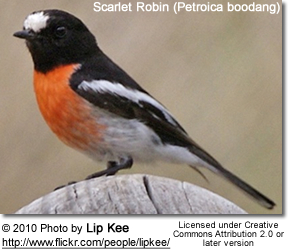 The Scarlet Robin is endemic to Australia, where it is found near the coast from southern Queensland to central South Australia, Tasmania and south west Western Australia. The species is mostly sedentary over most of its range, but some mainland populations undergo small local movements in the autumn and winter, either to more open habitats or lower elevations. The Scarlet Robin is most commonly found in eucalyptus woodland and forest from sea level to 1000 m, particularly the more open habitats with grassy and shrubby understories. During the winter more open environments, including urban habitats, are frequented. 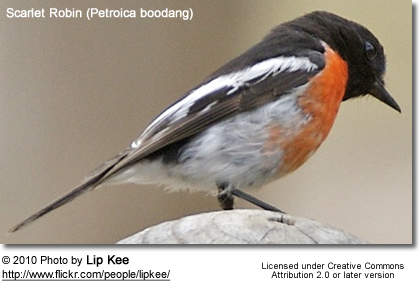 The Scarlet Robin feeds on arthropods such as insects and spiders. It adjusts its foraging behaviour seasonally, feeding mostly on the ground during the winter, but during the summer and spring prey is more commonly taken from bark and foliage. They are monogamous and territorial, defending their nesting territories fiercly. The male and female select the nesting site jointly. However, only the female builds the the nest, which takes four to ten days. The average clutch size consists of one to four eggs. The eggs can be of various colors, including grey, green or pale blue with brown olive-brown splotches and spots. She alone incubates the eggs, while the male brings food to her. The young hatch after 14 to 18 days of incubation. Both parents feed the chicks until fledging and some time thereafter.